Airport TransportationWorking in the business world, you have probably heard the saying, “Time is money.” So when it comes to business trips, you can imagine how much money you are wasting when you are going to and leaving the airport. When you consider taking a limousine or luxury car to the airport, you may think it is being a little excessive. But is it really? 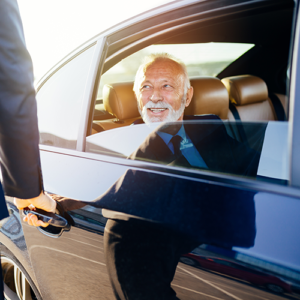 Aside from arriving to BWI in style, have you ever considered the benefits of using a limousine as airport transportation? At Blanchard Limousines, our convenient location among the Annapolis and Anne Arundel County Metropolitan area allows us to provide the savvy business class with airport transportation to BWI. Timely – By having a limo drop you off curbside, you arrive at the gate quickly. Searching for parking will become a thing of the past, saving you at least 10-15 minutes on your way to the gate. Cost-Effective – With airport transportation, you will save on expenses like rental cars, parking fees, tolls, and gas if you happen to get lost in your new location. Competence – Our drivers are trained to know traffic patterns like the back of their hand. By knowing high congestion areas, our drivers are able to pick the most efficient route to get you to your destination. Consistency – Our drivers make sure to arrive at your home or hotel early to ensure you arrive for your flight in plenty of time. We can also track flight changes to know when to pick you up from the airport once you have arrived back home. Productiveness – Imagine how much you can get done when you are free from driving. Spreadsheets can be reviewed, e-mails can be sent, and phone calls can be made while you are driven by one of our professional chauffeurs. Blanchard Limousine knows how important the beginning of a business trip can be. A stressful sendoff can make for a stressful trip in general. Let our limousines provide the best airport transportation and ensure a stress free start to a successful trip. Arrive to BWI with the confidence you need to get the job done. To book your limousine as airport transportation for your next trip to BWI, call Blanchard Limousines today at 1-(800)-447-LIMO. You can also fill out our contact form here.